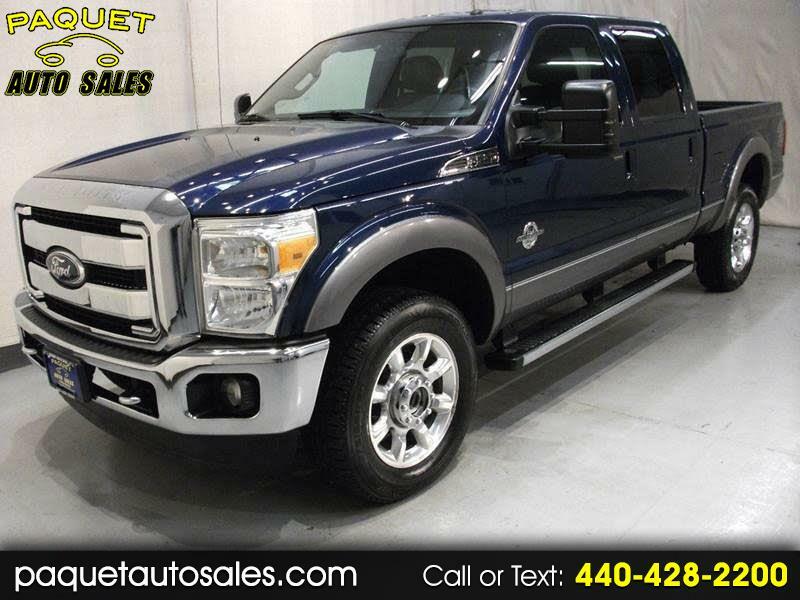 6.7 LITER TURBOCHARGED BIO-DIESEL---FOUR WHEEL DRIVE---REMOTE START---SYNC BLUETOOTH AND HANDSFREE PHONE WITH VOICE CONTROL---BACKUP CAMERA---LEATHER AND BEDLINER---ONE OWNER---NO ACCIDENTS REPORTED TO CARFAX--- 2011 FORD F250 LARIAT SUPERDUTY 4-door crew cab in a blue metallic with gray accent exterior finish, like new Nokian tires with 14/32's tread, 20 polished aluminum wheels, chrome bumpers, chrome front tow hooks, fog lamps, trailer tow package with hitch and electric brake controller, bed rail covers, tinted rear windows, power sliding rear window, automatic headlights, traction control, chrome tube-style running boards, chrome grill, body color door handles, black folding and extendable trailer tow mirrors with turn signals, keyless entry with multi-function remote and door mounted numeric keypad. Inside you will find a loaded black leather interior featuring powered, heated and cooled front bucket seats with headrests, center console/beverage holder, power windows, door locks and exterior mirrors, air conditioning with dual climate control and rear vents, tachometer, digital compass, clock and external temperature display, overhead sunglass holder with reading lights, dual lit vanity mirrors, power adjustable pedals, front rubber floor mats, tilt steering wheel with mounted cruise/stereo/info and handsfree controls, CD/Satellite ready radio with Bluetooth and aux. input, rear split folding and locking seat bottoms, folding rear center armrest/beverage holder, rear 110 volt A/C power outlet. Fully inspected by our service technician. Detailed inside and out and ready for delivery. Stop in or call today and speak with one of our friendly sales staff with any questions that you may have.